the first flight of the Canberra. Undeterred by 'Friday 13th', Wing Commander Beamont took off that day in May 1949, in the Canberra prototype. So accomplished was this new jet bomber that by the end of the 1950's, no fewer than 41 R.A.F. Squadrons were equipped with the Canberra, and the training of crews in another 16 countries had begun. 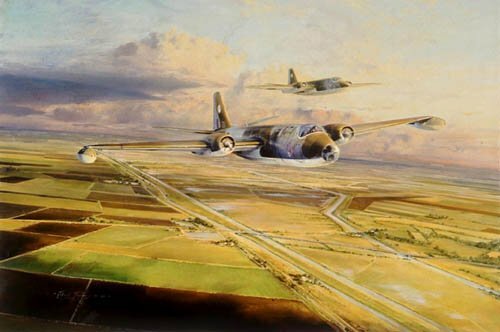 Robert Taylor's painting, shows the aircraft during a formation training sortie; rushing over the fenlands of Cambridgeshire, England, preparing to land at its R.A.F. Wyton base.